Traditional dentures often cause people discomfort due to movement and slippage along the gums. In addition, traditional dentures typically require the inconvenience of messy pastes or adhesives. Implant supported dentures allow our patients at Spring Lake Dental Care to replace their traditional dentures with a stronger and more reliable missing teeth replacement option. The implant denture technique used by our dentists in New Jersey can restore the appearance and function of your teeth with natural-looking results. 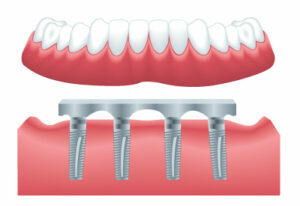 Implant supported dentures can replace multiple sets of missing teeth on the upper and/or lower arches. Instead of utilizing putties and adhesives to keep the dentures in place, an implant supported denture uses a dental implant to secure the denture and significantly reduce the potential for movement or slippage along the gums. This technique anchors your denture to the jawbone, providing it with greater stability. Dental implants are essentially artificial tooth roots. The implants will be strategically placed in the area of missing teeth, where they should fuse to the jawbone over time, ultimately becoming a permanent part of your mouth. Each set of dentures is firmly affixed to the implants for reduced movement along the gums and a more natural fit, without the need for dental adhesives. What Can Implant Supported Dentures Do For My Smile? The dental implants used to anchor the denture offer superior stability compared to traditional dentures. This added stability also allows you to enjoy foods that are often prohibited or problematic with traditional dentures. Since only four dental implants are required to replace an entire set of teeth, implant supported dentures can be a more cost-effective form of tooth replacement. Implant supported dentures are also ideal for patients interested in dental implants but lack the bone volume necessary for a full set. As an added benefit, All-on-4® implant supported denture procedures (described below) can typically be performed in a single day, giving you a natural-looking, beautiful smile almost instantly. If a full set of dentures is required, the All-on-4® technique may be the ideal procedure. All-on-4® involves the placement of a total of four implants on the upper and/or lower arch to anchor your dentures with the best possible stability. This treatment can be an effective measure for patients who are not candidates for a full set of dental implants and for those who desire better security for their dentures but do not want to replace each of their missing teeth with a dental implant. The All-on-6 implant denture technique is basically the same concept as All-on-4®; however, this option utilizes two extra dental implants per arch to secure the dentures. In some cases, patients may need these additional implants due to the overall quality of jawbone density and other factors that are important to provide the best possible comfort and security for the denture. Our dentist will evaluate your needs and determine whether the All-on-4® or All-on-6 method is the most ideal treatment for you. A full mouth restoration with implant dentures involves the replacement of missing teeth on both the upper and lower arches. This procedure can be beneficial for patients who need full sets of dentures on both rows of teeth. The All-on-4® method can often be utilized for full mouth restoration, placing four implants on the upper arch and four on the lower arch for a total of eight dental implants. In addition to implant supported dentures, our practice offers a number of advanced restorative dentistry procedures that can help patients looking for effective missing teeth replacement options. During your initial consultation, our dentist will talk with you about the most ideal treatment for your needs. If you are not a candidate for implant dentures, we will be happy to provide you with information on alternatives that can help you attain your goals. What Should I Expect During the Implant Dentures Procedure? Once you have been evaluated and determined to be a good candidate for implant supported dentures, our dentist will create a customized treatment plan. If you are getting full arch replacement and still have a few original teeth in the area, those teeth will need to be extracted before the implant procedure commences. Once detailed x-rays have been taken and a precise surgical plan has been developed, the implant posts (made of a durable titanium material) will be inserted into the gums and anchored to the jawbone. Over time, the implants should fuse to the jawbone, mimicking a natural tooth root. Then, a customized denture appliance will be attached to the implant post. Once the procedure is complete, your dentures should feel much more like natural teeth and they should not move or slip along the gums. It will take a few months for the implants to properly fuse to the bone. A temporary denture appliance can often be worn during this period, with the permanent appliance being attached once the fusion process is complete. Our dentist will explain all aspects of the procedure to you beforehand so you will know what to expect throughout each stage of treatment. The total price of implant dentures is heavily dependent on each individual patient’s unique needs. In most cases, implant dentures offer patients a considerable cost savings when compared to a full set of dental implants. The complexity of the procedure, the number of dental implants that are necessary to achieve your goals, laboratory costs, materials used, the geographic location of the practice, and the skill/experience level of the dentist are all components that factor into the overall cost. Our dental team believes that everyone should have access to quality dental care, which is why we offer a number of helpful payment and financing options. Once you have been examined and a treatment plan has been created, a member of our staff will produce an estimate of the total cost of your implant denture procedure and talk with you about the best payment options for your budget. We accept all major credit cards and we work with CareCredit®, one of the most reputable dental financing companies in the nation. CareCredit® offers a number of convenient payment plans that can help qualified applicants finance implant denture procedures over time. If you have questions about implant supported dentures, or if you would like to schedule a consultation here at Spring Lake Dental Care, please contact our office today.